A bit of a departure from my usual posts, this one is not on travel, but a very special event that takes place annually on Little Corn. While on the island in July, I learned of a spray and neuter clinic led by a group of veterinarians from the United States and Managua. I asked the head of the group Dr. Tom Parker if I could photograph one of the clinic days. Since 2008, Dr. Tom Parker and a group of volunteer vets have been offering a spray and neuter clinic on the Corn Islands. 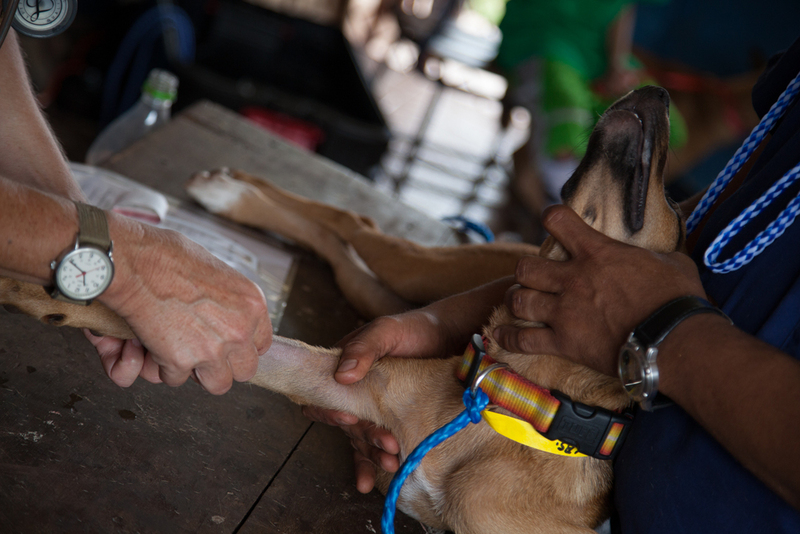 In addition to the surgeries, the group treats general ailments such as fleas and parasites. 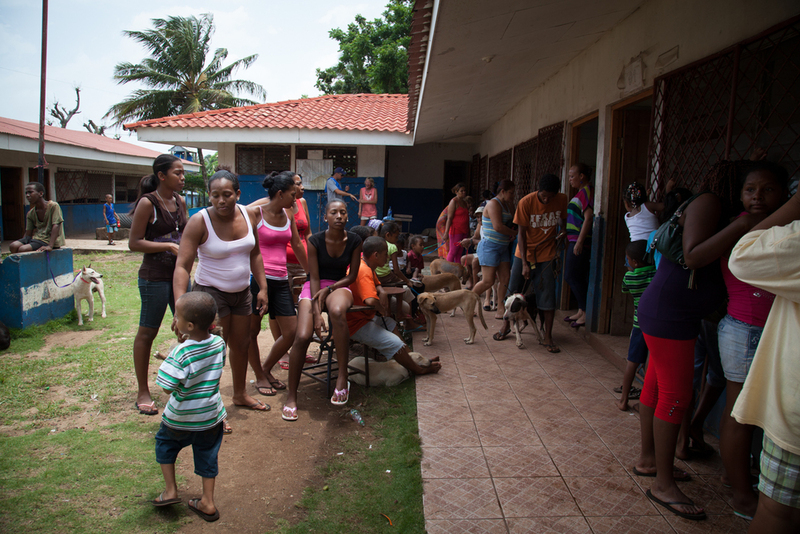 As there are no vets on the island, this is the only opportunity annually for the animals to be treated. Residents line-up for hours to see the doctors and over one hundred patients are seen over two days. On Little Corn, the local public school was used to hold the surgeries and treatments. The team was there over two days, and their work is invaluable in keeping the small population of pets on the island in good health. Above, three happy customers. Thank you!! After a non-stop 28-hour journey from Masaya, which included a chicken bus, a coach bus, one taxi, two pangas, and a very rough six-hour ferry ride across part of the Caribbean Sea, we finally arrived at Little Corn Island. Traveling overland to reach this remote Caribbean paradise was quite an adventure, and not one that I needed to do again. I happily took the plane back to Managua. Little Corn is a small island 70 kilometres off the Caribbean coast of Nicaragua. With an area of 2.9 square kilometres, it makes for a cozy stay, while neighbouring Big Corn is approximately three times larger. 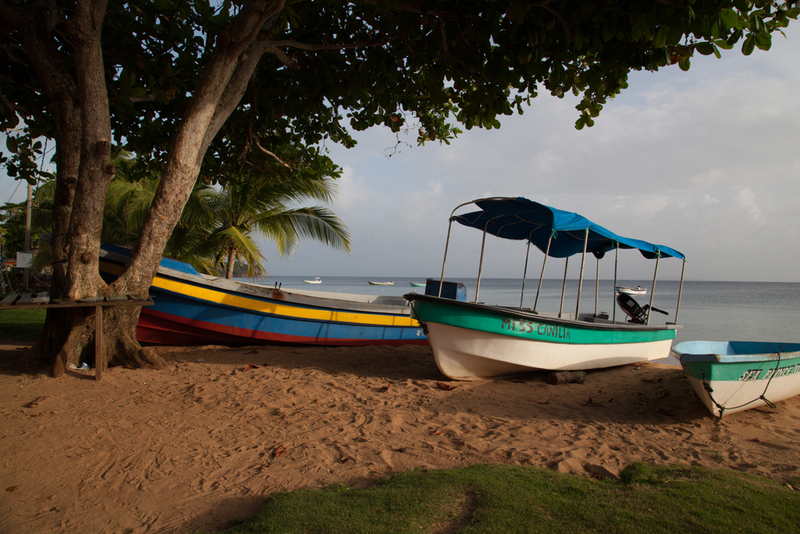 Demographically, the islands are quite unique to the rest of the country, local inhabitants are mainly native english speakers with creole ancestry. There are two main operators on the Island, Dolphin Dive and Dive Little Corn. There is also a third smaller one on the other side of the island. We dove with the locally operated Dolphin Dive. The island has become quite well-known for snorkelling and diving. Snorkelling can be done independently, and the most famous site for diving is Blowing Rock, located 25 kilometres from Little Corn. A large pinnacle that measures over 80 feet high, Blowing Rock juts out above the surface of the Caribbean sea. The wildlife around the rock is spectacular, with large schools of fish, and much larger fish than we’d seen elsewhere near the Corn Island. The other nearby spots we visited on days when the water was a bit rough, were all-in-all, largely unimpressive, with the exception of the site, White Holes. That said, Little Corn similar to the Bay Islands in Honduras remains one of the most affordable places to dive in the world. The open water course at Dolphin Dive was approximately $300 US, and a ten package dive was competitively priced at $280 US. And just a warning to observe the laws of the island. Note that theft of any kind by residents or visitors, as a first offence results in 3 days of community service. After the third offence, you are jailed! Note also that there are no bicycles on the street after 6 PM. You would think that would be hard to enforce, but there is only one main street on Little Corn - watch out! Travel tips for independent travellers regarding food and accommodations. Accommodations - The island has a range of hotels at different prices, but if you are looking to prepare your own meals, only the Three Brother's, a family run business led by Randy had a full kitchen available (in July 2013). The Three Brothers is located to the left of the dock on the same side of the island as the two main dive shops, while many of the other hotels (Casa Iguana, Beach and Bungalow, etc) are located on the more picturesque side of the island, along the beach. Food - The island has an overflowing supply of beautiful yellow altufo mangos, you can find the trees everywhere. Aside from mangos and the rare avocado and breadfruit tree, most of the food is imported to the island, and everything is sold at a premium (even the rum!) If you want do your own cooking or even enjoy a nice bottle of Flor de Cana, pick up some supplies at Bluefields. There are stores that sell groceries and certain houses sell delicious coconut bread - ask around. Freshly caught fish and seafood is also available daily by the dock. We were there during lobster season and feasted on fresh fish, lobster and conch! Water - In an effort to reduce waste on the island, there is infrastructure set up for recycling. The island also offers free filtered water at stations (one is located just by Three Brother's), and many residents have potable well-water. Help the island limit its footprint! Here is some info on logistics if you planning to go overland to the Corn Islands. http://www.bigcornisland.com/river.html. One difference we found compared to the website, for the first leg of the trip, regular coach buses not just chicken buses also leave from Mercado Mayoreo.